The Gray Whale or Grey Whale (Eschrichtius robustus), more recently called the Eastern Pacific Gray Whale, is a whale that travels between feeding and breeding grounds yearly. It reaches a length of about 16 meters (52 ft), a weight of 36 tons and an age of 50 - 60 years. Gray Whales were once called devil fish because of their fighting behavior when hunted. The Gray Whale is the sole species in the genus Eschrichtius, which in turn is the sole genus in the family Eschrichtiidae. This animal is one of the oldest species of mammals, having been on Earth for about 30 million years. In the remote past it was preyed upon by Megalodon sharks (which are now extinct). Two Pacific Ocean populations of Gray Whales exist: one small population travelling between the Sea of Okhotsk and southern Korea, and a larger one travelling between the waters off Alaska and the Baja California. A third, North Atlantic, population was hunted to extinction 300 years ago. In the fall, the California Gray Whale starts a 2 - 3 month, 8,000 - 11,000 km trip south along the west coast of the United States and Mexico. The animals travel in small groups. 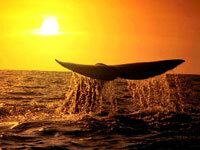 The destinations of the whales are the coastal waters of Baja California and the southern Gulf of California, where they breed and the young are born. The breeding behavior is complex and often involves three or more animals. The gestation period is about one year, and females have calves every other year. The calf is born tail first and measures about 4 meters in length. It is believed that the shallow waters in the lagoons there protect the newborn from sharks. After several weeks, the return trip starts. This round trip of 16,000 - 22,000 km, at an average speed of 10 km/h, is believed to be the longest yearly migration of any mammal. A whale watching industry provides ecotourists and marine mammal enthusiasts the opportunity to see groups of gray whales as they pass by on their migration. The whale feeds mainly on benthic crustaceans which it eats by turning on its side (usually the right) and scooping up the sediments from the sea floor. It is classified as a baleen whale and has a baleen, or whalebone, which acts like a sieve to capture small sea animals including amphipods taken in along with sand, water and other material. Mostly, the animal feeds in the northern waters during the summer; and opportunistically feeds during its migration trip, depending primarily on its extensive fat reserves.